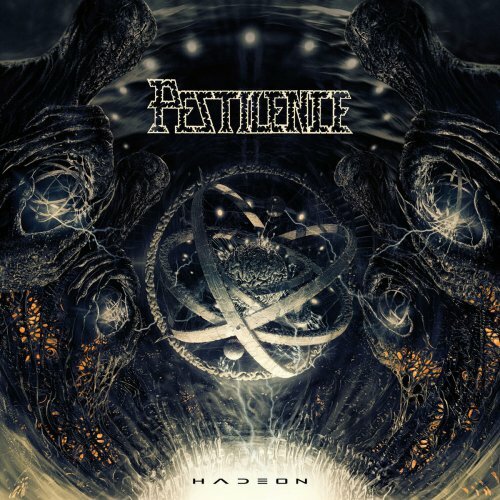 If it weren't painfully obvious from the cover artwork, Hadeon is a clear homage to Pestilence's early 90s output, namely Testimony of the Ancients and its jazzier, stranger successor Spheres. In this it draws some comparisons also to their divisive 2009 reunion effort Resurrection Macabre, on which there were clearly some stylistic parallels to Testimony, albeit handled in a more methodical, brutal and explosive way that I happened to really enjoy. Unlike that album, however, Mameli and company have done away with the idiosyncratic barkings of the song titles within the fore and aft of each track. Unlike its true 1991 precursor, you also won't a whole roster of experimental vignettes to distract you from the meat of the metal, and that actually ramps up the album's effectiveness. That's not to say that some experimentation doesn't exist...like the intro, or the instrumental interlude "Sudivisions", upon which bassist Tilen Hudrap flies all over his frets until we become dizzied by his absolute mastery of that instrument. The first moment of "Astral Projection" is a strange robotic sort of proggy narrative which wouldn't have been out of place on Spheres, without the production gaffes that many complained about on that album. For most of its playtime, however, Hadeon is a relatively straightforward affair that plays it safe for fans of the aforementioned albums, but occasionally rips out a riffing progression, melody or technique that hasn't been beaten to death already. To those who abhorred their previous, mechanical groove-laden records Doctrine and Obsideo, I think this might prove a welcome relief, for while it does often feel like its paraphrased from songs they've already written, that dark, overall jazzy vibe to the sliding chords combined with the brute vocals and leads that hearken back to the fusion elements the band was so beholden in the 90s still feels fresh and unique enough to stand out against a wide landscape of bands that never quite took the carrot. The production is punchy and polished, akin to its direct predecessors, which pairs up well with the busy but clean bass-lines which are a joy to hear throughout. Mameli still might not have the same bloodsoaked charisma as van Drunen during the band's fantastic, formative phase, but he is more than adequate to the task, adding a nice little grueling sustain to many of the lines that provides a cool counterbalance to the much tidier tension of the riffs. Septimiu Hărşan's drums are likewise up to par, an intense but controlled performance that loads in just enough fills for propulsion to what are a generally mid-paced set of rhythms, yet he could fly off the handle at will, and the double kick is sounding as effortless as you could want it on any modern death metal recording. But most important for me, is that Hadeon grew on me across successive listens, easing me out of the whole 'well this just sounds derivative' category and into genuine enjoyment. There hasn't been a Pestilence studio album that I've actually disliked, but this is far more in the direction of where I think they 'need to be' than the last two, with more fluid and intricate musicianship that they had eschewed to attempt that more pounding, grooving, hypnotic effect. The songs aren't unanimously memorable, but I think if they use this as the groundwork to launch this particular style onto an even more insane, intense plain, then I'm looking forward to the flight.